A marketing agency's perspective on how brands can recharge their content marketing in Singapore. Having a love-hate relationship with Content Marketing? Have you been using social media for content marketing for the past few years but are starting to question yourself when you stare at your stagnant FB page performance data (besides media $ pumps)? Are you no longer sure what is right or wrong, or what else you can do? We have heard this so many times, so don't worry. Let's start with a quick Q&A for yourself. What is the frustration as a marketer in Social Media? Have I produced enough content? Am I distributing my content to my target audiences? Is my content able to engage & lead them to call to action? 55% of marketers wish they can produce more content. Are You Surviving In This Digital Zombie Apocalypse? Look around you. Is anyone looking at you right now? No! Everyone is glued to their laptop, ipads. mobile phones. We have immersed ourselves in the digital landscape, consuming content online anytime, anywhere. As marketers, we know that content is KING. Truth is digital content marketing is more important than ever. And people tend to forget the QUEEN - Content Distribution. Social Media happens to the the most accessible platform to do so. Agree? However, Social Media, or Facebook for one, is about social networking. This is exactly what Facebook is trying to reinforce. We are all aware that there’s no free organic reach as there was 5 years ago and you generally don’t know how they determine the reach, engagement and relevance score for what you have posted. Despite the fact that it is more like an advertising platform for businesses now, it is still one of the most convenient channels to access potential audiences. The magical word here is the "algorithm". The key is to know how to play this game to your advantage! Content Is King. He Loves A Story. Oh dear! I can talk about the hows and whys of content for hours, but let's cut the story short. If there's one winning secret that i can leave with you, it will be STORYTELLING. So here's the fun part. Everyone loves a story, with the juicy details, just like chitchat between you and your BFF. It has to be genuine and personable, give value (Eg: educative, entertaining, informative, enlightening) and leave an impression (Eg: an emotion, a thought, desired action such as sharing or wanting to buy?). A compelling story is influential. Research has shown that most people buy with their heart, not their mind. Once you have identified the objective and target audience for your content post, the sell can happen in many different story forms. #1 Identify their interest and concern, so you can paint a true scenerio that can resonate with them. #2 Highlight how your product/service can add value to their lifestyle. #3 Present your content story in a refreshing and unexpected approach that is attention-worthy. It is being there for them during their micro-moments. The context of your approach and messaging has to hit the sweet spot at the right time. If not, they will swipe past you on the newsfeed, less engage with you. It definitely takes more than just a static designed ad to do the trick. Audience has to be able to visualize and to feel it. Which is why video is the favourite child now, especially on Social Media. Target audience: I’m health conscious and believe in giving the best nutrition for my family. The children are very particular about the taste. I always buy the same kind of bread, not knowing the other options available and the real difference. Target audience: I love shopping and I’m a bargain hunter. However I see sales and promotions ads everyday and everywhere till a point that I don’t feel anything when I see one (that is if one actually caught my eye). Target audience: Thinking of eating pizza. No particular brand loyalty. What flavour is new and popular? Is there a promotion going on? Creative and original, these can differentiate your posts from the many other images that are flooding the newsfeed. Think attention-grabbing first. Content marketing requires conscientious efforts and strategic implementation. Think about how your content can attract and engage first. The sell will follow naturally. To do well on Social Media, you need to keep an open-mind and be adventurous to explore possibilities. Facebook likes you to vary your content formats and keep up with interaction on your FB page. Stay active not with the number of posts, but with effective storytelling and presentation, as often as you can. If content is done right, engagement will happen. This is when the magic starts to happen on Facebook. 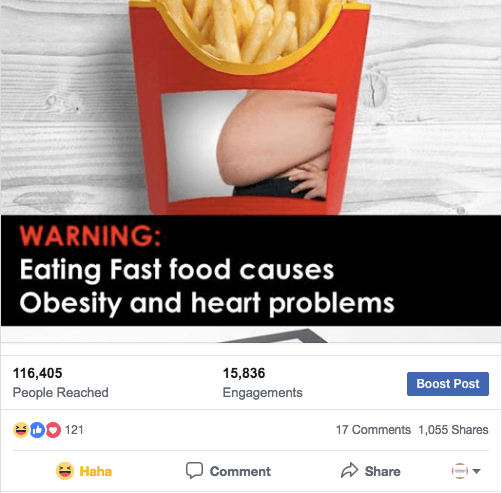 Your post has to garner immediate and fast responses from your audience in order for the algorithm to identify it as relevant and of interest. The result is an organic push for better reach, courtesy of Facebook. We can make that happen! More and more clients have learnt to loosen up and spice things up with creative, lifestyle content approaches. Brands love us because of our strong acumen for business & integrated marketing expertise, with localization being our core guiding light. Together with our team at OCG, we are creating more sharable content assets in the form of trending MeMes, lifestyle editorials, humourous videos, real time photos, and engaging campaigns, while seeking new ways to reach out and captivate the interest of consumers. Through our newly established Digital Influenza Network, an ecosystem of media outlets, content publishers, social media groups and influencers, content distribution can be strategically orchestrated for maximum exposure. With amplification through our Digital Influenza Network, immediate engagements can be made possible and your content post will spiral off to success. The viral power lies within this network effect that we harness. Don't sweat over what to post on your FB next week. Let us take care of that for you, so you can spend more time on the more important work stuff and earn a thumbs-up from your bosses. Look Ma! It has gone viral! More than a thousand shares within 24 hours. We scored a Perfect 10! 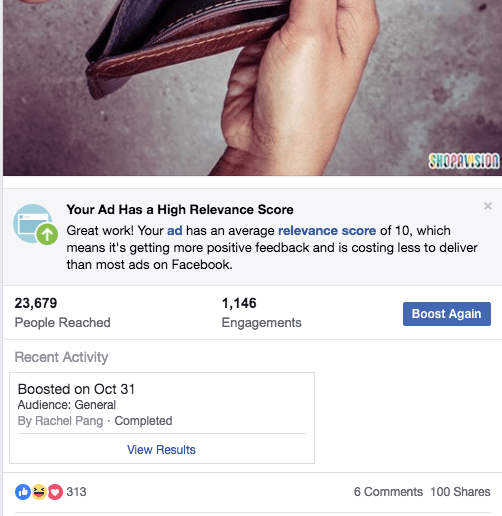 A FB post/ ad Relevant Score of 10 is possible! All stars aligned - concept, creative, copywriting, timing, targeting & content distribution. Our post was already achieving high organic reach and engagement before we throw in less than $30 for a boost. The result is a immediate viral burst and an 80% saving on media budget boost for the post. Done right, you can achieve this too!